Practice Weather Vocabulary with this ESL Vocabulary and Grammar Interactive Crocodile Board Game for Beginners (rain, sun, wet, dry, cloud, snow, wind, storm etc). ESL Learners and Teachers can use it to review English vocabulary and grammar or simply practice these words. There are images and in some cases audio in these types of games. Please note that if you want to stop hearing the introductory audio repeating, simply click the start button. Click on the dice to roll. A random number will show up and you will advance. There are traps on the way. Do not land on a flamingo. Flamingos eat frogs. A question will pop up and the player must choose the correct answer or risk going back. Meeting a crocodile is ugly - you get eaten and you go back to start. The bug is your best friend - frogs eat bugs to get strength. Games are great for motivating students to learn. By playing our fun educational games, students can practice and review key English vocabulary, grammar and sentences without the boredom which is usually encountered when doing paper-based gap-fill exercises. 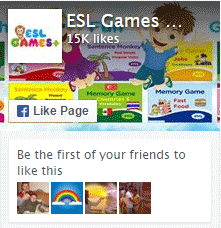 Play the game below and do not hesitate to share these resources with other learners. This is the philosophy behind our site - www.eslgamesplus.com.